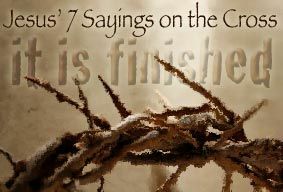 Therefore when Jesus had received the sour wine, He said, "It is finished!" And He bowed His head and gave up His spirit (John 19:30 NASB). If you are like me, you find it hard to imagine these words describing your life's work. For years, I had a cartoon outside my office door that read, "If everyone is assigned a certain amount of work to complete in a lifetime, at this rate, I'm going to live another 100 years!" My problem is that I would have to add, "And I'm falling more and more behind each day." Jesus' last words on the Cross are both startling and a little confusing. The Greek word behind the translation "finished" could be understood with different shades of meaning. Jesus could be saying that all his work is "completed" — that he had gotten everything done he was supposed to do. On the other hand, Jesus could be meaning that the debt of humanity's sin had been "paid," as a number of popular authors have emphasized. Or, Jesus could be meaning that life was "over" and he had no more time on earth to do his Father's work — something that he clearly seems to suggest throughout the Gospel of John, especially chapters 13-17. Or Jesus could be saying that his primary mission in coming to earth was fully "accomplished" even though there was clearly more that he could do to bless people if he continued living. Another possible shade of meaning is that Jesus is saying that he had "passed" the test he was given by the whole ordeal of the Passion and his battle with the prince or ruler of this world was won. The way John often uses words to carry a number of different meanings suggests that as he translated Jesus' Aramaic words into Greek, he specifically chose a word to carry all of these nuances. Each is especially appropriate as a description of what Jesus did for us on the Cross. Don't you find it amazing that Jesus could live only 33 years and that any of them be true, much less all of them. Jesus did many other things as well. If every one of them were written down, I suppose that even the whole world would not have room for the books that would be written (John 21:25 TNIV). I'm going to have to live to do the Father's will! Jesus performed many other signs in the presence of his disciples, which are not recorded in this book. But these are written that you may believe that Jesus is the Messiah, the Son of God, and that by believing you may have life in his name (John 20:30-31 TNIV). When I get to the end of each day, I'm always amazed at how much I didn't get done that day. I can't imagine looking up from my deathbed and asking the Father to take me home forever because I've done all I was supposed to do. Jesus could, because he did! Yes, Jesus paid it all. He finished God's work for him. He faced his death with love, grace, and forgiveness even when he was treated harshly, fully paying our debt to ransom us from our sin. When Jesus' earthly life was over, he was certain that he accomplished what God had sent him to do and that he had passed every single test that had been thrown at him. He completed what he had come to earth to do. And he did it all in just a little over 3 decades of time and taking every Saturday off so he could go to the synagogue. Amazing! �My food," Jesus said, "is to do the will of him who sent me and to finish his work" (John 4:34 TNIV). I'm always amazed at how much I didn't get done. This realization leaves me with two powerful convictions. First, if I am ever going to get any sense of accomplishment out of my life, then I'm going to have to live to do the Father's will and seek to complete his work in my life. How you will know when you’ve done what the Lord has put you on earth to do? Do you believe you were put on earth by God with a specific purpose and specific things you were supposed to do? How do you know what those are? Do you think you will realize when you have “finished” what God put you on earth to do? What do you think Jesus means when he cries, “It is finished”? "It Is Finished" by Phil Ware is licensed under a Creative Commons License. Heartlight encourages you to share this material with others in church bulletins, personal emails, and other non-commercial uses. Please see our Usage Guidelines for more information.